Congratulations to A.M Wright who placed the winning bid of $2,750 for April's silent auction painting "In the Vineyard", by Alexander Pavlovich Sukhov, estimated at $4,000- $5,000. Every good art collection needs a standout still life and this months silent auction painting is just that. 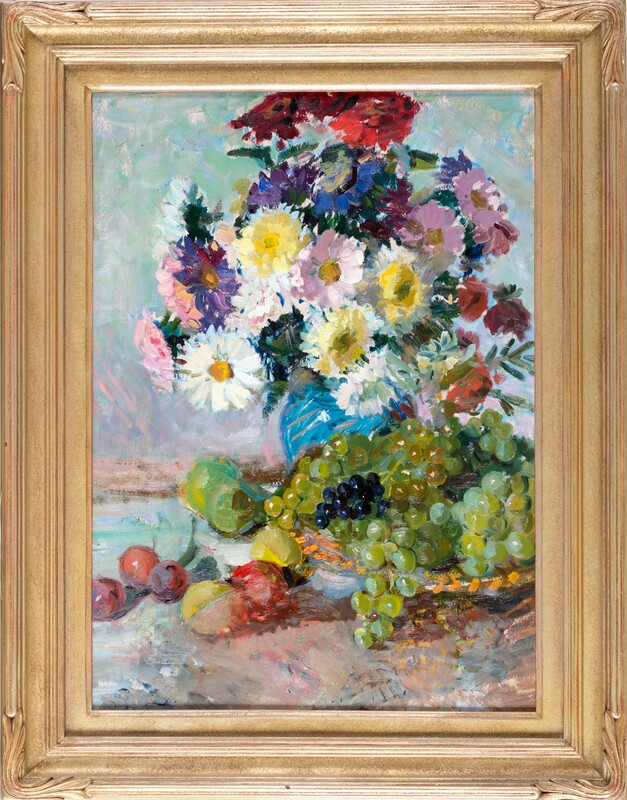 We are pleased to present as our May silent auction selection a wonderful still life, "Flowers and Fruit", by Valeri T. Nikitin, estimated at $3,500- $4,500. Valeri Timofeevich Nikitin is one of the best artists of his generation and a remarkable representative of the Moscow School of painting. On the 70th-anniversary exhibition of the all-important Moscow Union of artists, the greatest artists from the vast Soviet Union were asked to participate. It was a most prestigious invitation. Not only did Valery Nikitin participate--he was awarded the prestigious 'Konchalovsky Prize' for the best work in the exhibition. Valeri Timofeevich Nikitin exhibited extensively across the 12 zones of the old Soviet Union, doing several major retrospectives. His work is held in museums and personal collections throughout the world. This still life, "Flowers and Fruits" is from the golden age of Soviet painting, it is an important piece. It is framed in a 24 karat gold, Krieger-Ricks frame that sets the work out as a piece of art to last the generations. 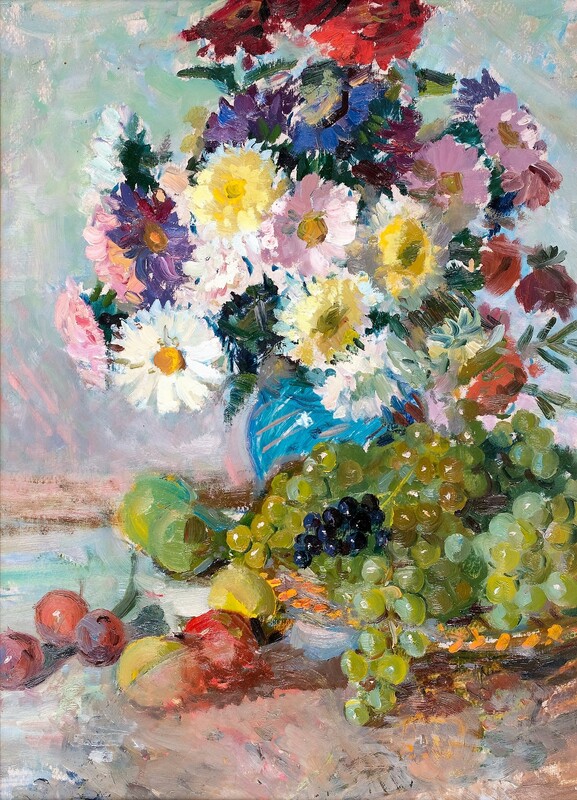 Valeri T. Nikitin, "Flowers and Fruit"
We invite you to participate in this month's auction and thank everyone who placed bids last month. This is an exceptional opportunity to add a beautiful work by a noted artist to your collection. Estimated at $3,500 - $4,500, the current high bid is just $2,000! The next bid is $2,250, followed by minimum bidding increments of $250. Remember, there is no reserve, at the end of the auction the high bid wins! Bids will be taken via telephone, or e-mail until 7:00 pm MST, Friday, JUNE 1st. Follow all the bidding updates on the Gallery's website. Born February 8, 1942 in Moscow (Kitay-Gorod, Solyanka). Nikitin became interested in drawing when he was 12?13 years. He copied the works of masters of painting with watercolor reproductions. At this time he studied at art school and sang in the choir, and was fond of sports. His fondest memories of childhood were in Tarusa, a village near Mansurovo, where his parents had taken him in the summer. Fields, forests, rivers, herds of horses, cows, sheep returning from pasture, stirred his imagination. An abundance of strawberries, mushrooms, nuts was a pleasant surprise. All these things played a role in the future work. In 1963 Nikitin entered the Higher Stroganov School in the art and interior design department. He studied for the next 2.5 years and then left the school continuing independent studies TSDKZH. Nikitin often visited the Tretyakov Gallery, and the Pushkin Museum, where he studied and learned from the skill of great masters. In 1968, for the first time participated in the exhibition of Moscow Union of artists in the youth division. In 1970, Nikitin enters again the High Stroganov School, but this time in the Department of Monumental painting where he studied under the famed academician G. M. Korzhev. Nikitin graduated in 1975. In 1976, for the first time the young artist went to Creative cottage in Pereslavl-Zalessky, where he painted "Self-portrait in a Cracked Mirror", along with other works. In 1977, he participated in an exhibition of young artists from all over the Soviet Union. 2 of his works were bought by the exhibition Director. In 1978 he became a member of Moscow Union of Artists, recommended by famed artists G. M. Korzhev and P. F. Nikonov. Nikitin would participate in all subsequent exhibitions of the Moscow Union of artists and Russian. In 1992, Nikitin held a personal exhibition at the Central House of Artist's. The exhibition was well received by the audience and journalists, and critics. Many of the works were later purchased and exported to America, Turkey, Korea, Germany, England, France, Israel and in private collections of Russia, Ukraine, Uzbekistan, Georgia, Kazakhstan, Tajikistan. In 2003 Nikitin held a second solo exhibition in the exhibition hall of the Union of Artists. The exhibition was opened by the noted academicians and people's artists award recipients- Y. Pavlov, E. G. Bragovsky, A. I. Surovtsev, V. A. Glukhov. All of whom had many kind words about the work. Bragovsky in particular said that Valery Nikitin is a significant phenomenon in our art, a wonderful representative of the Moscow school of painting". In 2003, at the 70th anniversary of the Moscow Artists' Union exhibition, Nikitin was awarded the Konchalovsky prize, named after the famed artist, for best work in the exhibition "Fish". "Flowers and Fruit", 24 karat gold leaf, Krieger-Ricks frame. In 1968 participates in the exhibition of Moscow Union of artists youth section. From 1976 - 1978 he participated in all exhibitions of the Moscow artists ' Union and Republican. 1987 - Exhibition in the Moscow artists ' Union, Moscow. In the 1990-ies exhibited in the halls in Moscow, Germany, and France. 1995 - "Golden Brush" international exhibition of the Committee on culture. Moscow. 1996 - Exhibition, Frankfurt. Germany. 2002?2003 - Personal exhibition in the exhibition halls of the Union of Artists, Moscow. 2002?2003 - Exhibition dedicated to the 70th anniversary of Moscow Union of artists. 2003 - Exhibition "World of Painting", Central Artists House, Moscow. 2006. - A series of exhibitions of Moscow painters: "Traditions and search". 2007 - Personal exhibition. Moscow "Corridor of Life". Exhibition hall of Artists Union, Moscow. In 2003 was the publication of V. Mayland in the newspaper "September 1", "solar wind passing days". V. T. Nikitin is a series of "100 Russian artists". "Directory Nikitin Valery Timofeevich" Moscow, 2007, in the gallery Konoser. Nikitin work are in collections in the USA, Turkey, Korea, Germany, England, France, Israel and in private collections in Russia,Ukraine, Uzbekistan, Georgia, Kazakhstan, Tajikistan.